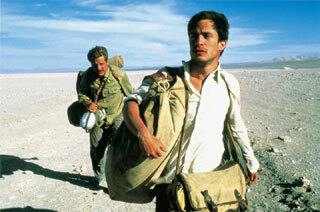 Two movies to look forward to: The Motorcycle Diaries and A Day Without a Mexican. Diarios de motocicleta is based on a trip the young Che Guevara took across South America with a friend -- or, as his family describes it, a trip taken by Ernesto Guevara before he became the revolutionary Che. You don't have to be a fidelista to be interested in that premise. The movie is directed by Brazilian Walter Salles (Central Station) and stars Gael García Bernal (Amores perros, Y tu mamá también). That a Brazilian would direct such an iconic movie about Hispanoamérica is intriguing; it reminds me of the statement of Guevara's travelling companion, Alberto Granado, that "Like most Argentineans at the time, we knew more about the Greeks and the Phoenicians than we knew about the Incas and Latin America." I get the feeling that most Brazilians know as little about Spanish-speaking Latin America as do we gringos. 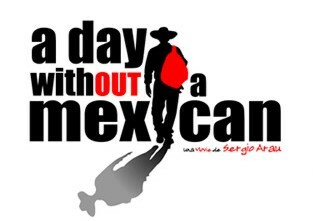 A world away in tone and geography is A Day Without a Mexican, a comedy in which anglo California gets its wish and all the latinos suddenly disappear. "I had to wash a dish!" exclaims a horrified restaurant owner. "I had to risk my life for a tomato!" cries a consumer. You get the idea. I expect the humor, though broad, to be pretty good -- it's directed by multitalented journalist/artist/musician Sergio Arau. Both movies' websites are pretty interesting, but if you want to be horrified, take a look at the forum for A Day Without a Mexican. You'll think you're at a Klan rally.